In celebration of the 100th anniversary of May Gibbs’ Gumnut Babies, Australia Post has released a commemorative stamp pack and a commemorative stamp and coin cover. 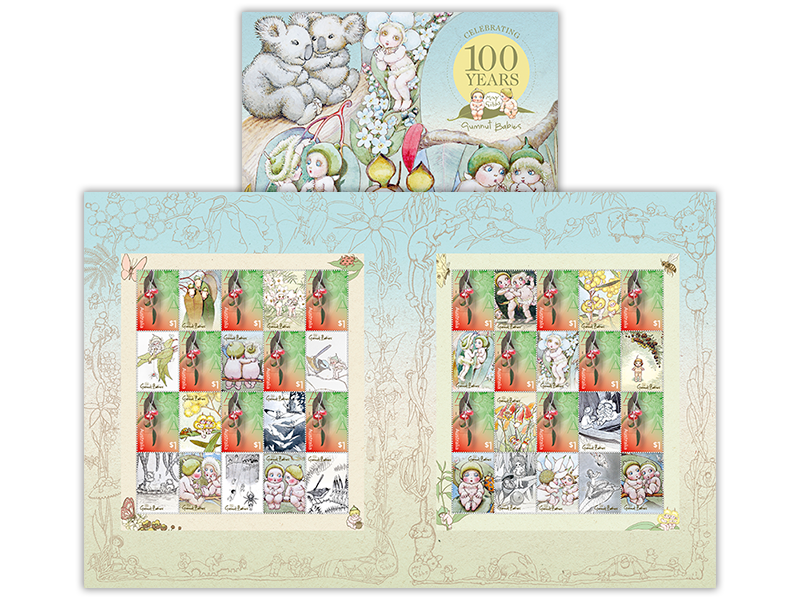 The May Gibbs’ Gumnut Babies stamp pack comprises two 8 x $1 sheetlets featuring the Gum Leaves stamp from the 2016 Love to Celebrate stamp issue. The tabs on the stamps feature classic illustrations the books of May Gibbs. The stamp and coin cover is highly collectable, featuring a pictorial envelope with the Gum Leaves stamp the 2016 Love to Celebrate stamp issue affixed and a coin from the Perth Mint. The stamp is postmarked 29 March 2016 | Gumly Gumly NSW 2652. Limited to 5,000. For more details and to buy now, visit the Australia Post shop online HERE.